There are better-constructed, more versatile instruments on the market, but there are few that offer such an infectiously fun and quirky playing experience. Sensible hardware upgrades equip the guitar for gigging. Great vibe. It wasn't built for extreme gain sounds. Infectious fun infuses the playing experience. The lipstick single-coils are Almico-loaded. Based on the twin pickup 1956 U-2 model, the ´56 Pro retains a great deal of charm but provides some worthwhile upgrades in the hardware and electronic departments. Two immediately noticeable deviations from classic spec are the sealed chrome tuners and bridge with adjustable saddles, taking the place of the rosewood-saddle bridge of old. Purists may lament that this detracts slightly from the white-knuckle ride of the original design, but the benefits in terms of both tuning stability and intonation are considerable. Other notable departures include the headstock shape, now a non symmetrical variation on the classic ‘Coke bottle´ outline utilised between 1956 and 1966, and on the later reissues. The scratchplate is a clear, unadorned affair that lacks the printed stripe and ‘D´ logo found on most U-2 models. This arguably makes for a slightly more sophisticated look overall, and the deep red finish is similarly understated. That said, if you love the candy shop cosmetics of the originals need fear not as there are a range of finishes available. While the Danelectro website details six finish options, baby blue and gold are not currently being brought into the UK. First impressions upon picking up the guitar and subjecting it to a cursory strum are very positive indeed. There is an appealing resonant quality to the acoustic tonality that is a little rounder and less zingy than the previous reissues, but this concurs with a perceived increase in physical weight. Fretwork is good, with no sharp ends protruding anywhere along the length of the 21-fret rosewood fingerboard. At the headstock end, the aluminium nut is secured with a small unobtrusive Phillips screw, while truss rod adjustment is carried out at the body end and requires the removal of the five-bolt neck. You may find that the aluminium nut will wear quicker than a graphite or even plastic nut, but in the event of this occurring, a nut upgrade is hardly major guitar surgery. Around the back of the body, along with the neck bolts there are screws for adjusting the height of the twin lipstick single-coil pickups, which retain their authentic two piece casing - a nod back to when they were culled from actual lipstick cases in the 1950s. This time, though, the pickups are hotter Alnico loaded units. Access to the guitar´s electronics is achieved by removing a cream formica disc that covers the circular entrance to the body cavity. This is secured with one small screw into a floating section of hardboard inside the cavity and, while it is simple and quick to access, we found it rather fiddly to replace to say the least. Inside the chassis, the somewhat rudimentary construction of these guitars is visibly evident, with a laminate block frame supporting the masonite (hardboard to all intents and purposes) top and back sections. Evidently, this is no solid mahogany blues machine, so we were keen to see how the construction translated into the amplified arena. Through our Orange AD30TC head, set clean, the ´56 Pro bridge pickup serves up a juicy platter of sixties twang and chime with a bright, articulate voice. As the gain increases to crunch, those hot Alnico lipstick pickups are in their element as a raunchy garage rock tonality emerges, echoing the cutting, aggressive sound of The Hives, or even Townshend´s squalling early Who rhythm attack. The semi-hollow construction brings an open airiness to proceedings. Extreme gain sounds aren´t what this Danelectro was built for, but it handles a degree of high gain before becoming an uncontrollable, noisy mess, but then perhaps that´s what you want in the right musical environment. Confronted with a Pro Co Rat pedal pushing an already revved up amplifier, we were pleasantly surprised that microphonic feedback didn´t present anywhere near as much of a problem as we´d expected, although any great degree of subtlety isn´t really on the menu in these circumstances. The neck unit is positioned quite far back and this aids definition and sparkle. And while the neck unit alone and the twin pickup mix (which links the pickups in series, as opposed to parallel like a Telecaster) warm things up nicely in both clean and crunch arenas, there´s still a degree of Fenderlike bite and quack that prevents things getting too mushy. If it is mush you desire, however, try placing a fuzzbox in front of your amp and engaging the neck pickup for a fat, Jack White-like garage blues sound. While this isn´t a guitar that is immediately suited to emotive lead work or warm jazz, there is definitely a place in many a player´s guitar armoury for the kind of instrument that rewards attitude and a forceful picking hand attack in the way this Dano does in spades. Arguably there are a multitude of better-constructed, more versatile instruments on the market for £299, but this statement comes with the caveat that few competitors will be able to match the ´56 Pro for pure personality - amid a sea of generic copies, there is a lot to be said for that. While there are no smooth jazz or warm blues tones here, there is a whole world of jangle, sparkle and twang that equips the guitar for everything from sixties pop to delay-laden alternative rock. 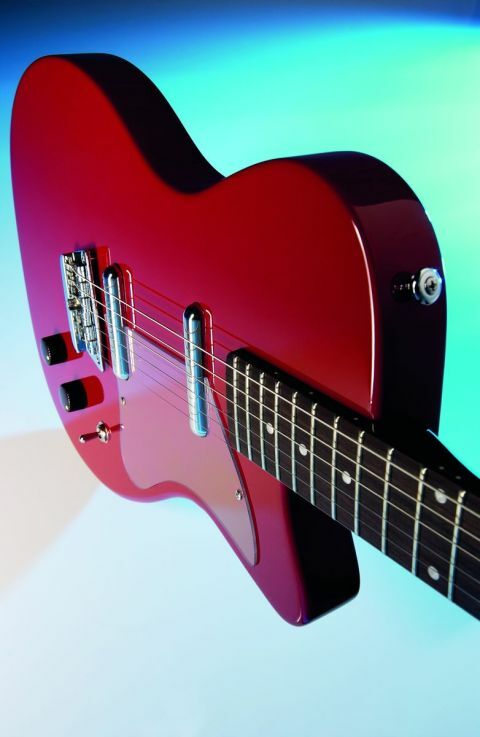 Thanks to expedient design improvements - such as the sensible choice of a more reliable bridge that intonates correctly and more powerful pickups, the guitar is more than capable of holding its own in a live situation in the right musical niche. You wouldn´t necessarily chose one to plug into a Dual Rectifier, but if your distorted kicks come from a string of fuzzboxes then it could be perfect for lo-fi meltdown or garage grunge. Equally, we can imagine banging out abrasive riffs through a cranked AC30. Above all, an undeniably infectious sense of fun infuses the playing experience. It´s great to have these quirky instruments back.